The firm is making Washington, D.C., its first office to offer on-site counseling services—and finding pent-up demand. 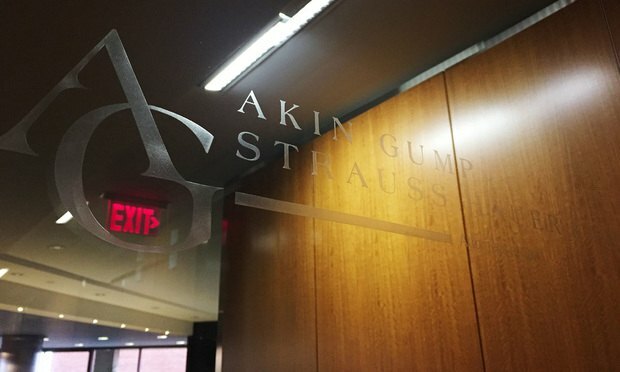 Akin Gump Strauss Hauer & Feld is taking new steps to prioritize its lawyers’ mental and emotional well-being, starting in its D.C. headquarters. "In the trial world, I see an array of subtle, unsubtle and utterly ingenious strategies being devised by other lawyers to deploy on each oth..."
"The people bringing the suit would like to return to a day that’s long passed," says the Wilmer partner representing the school in a challenge to its admission policies regarding Asian-Americans. 2018 was a year of modest growth for many in D.C., a trend expected to continue this year. The firm continued its run of growth in revenue and partner profits amid a merger with 100-lawyer New York firm Fitzpatrick Cella. potential of the people reporting to you. What is Your Talent Retention Strategy? Which firms are hiring new talent and where? Which firms are losing talent and to who? Where should you look to identify new talent? Identify, contact, and recruit the right talent using Legal Compass. Log into Legal Compass to get the latest reports on lateral moves, layoffs, and more. Learn how your firm can apply technologies such as intelligent automation and AI across the entire client lifecycle to win more business, operate more profitably, and deliver higher levels of client satisfaction. This ebook examines how firms can leverage data and technology to build stronger client relationships, empower business development, and fuel growth. This eBook examines the gaps and inefficiencies in the current state of timekeeping and billing at law firms. The National Law Journal Elite Trial Lawyers recognizes law firms that have performed exemplary work on behalf of plaintiffs. The National Law Journal honors attorneys & judges who've made a remarkable difference in the legal profession in the D.C. area.